When asked who my favourite Hollywood star is, I always find that a difficult question to answer. I’m a big fan of Brad Pitt. He’s had some fantastic iconic roles in Hollywood, the ripped Tyler Durden in Fight Club, the brooding Jesse James in the undervalued Assassination of Jesse James by the coward Robert Ford, the portrayal of Baseball GM Billy Bean in Moneyball….the list goes on and on. The ever young Leonardo DiCaprio maybe? He’s excellent In Revolutionary Road, Departed, Gatsby and even in the turgid slog Wolf of Wall Street his performance was top notch. But taking all things into account George is my man, the grey haired silver fox ticks all the boxes for me. He made his big break in E.R (1994-1999) and never looked back. Not many have successfully turned from a soap star into a Hollywood Legend, Demi Moore and Tommy Lee Jones notable exceptions. This slow burn Thriller is terribly underrated in my opinion. 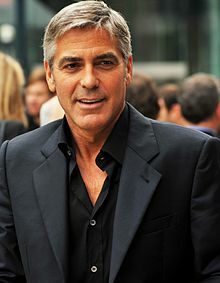 Clooney plays Jack/Edward, a specialist gun maker who works and lives alone. The film plays out in a sedate way, this is no James Bond or Bourne. It’s a sombre but weighty drama that keeps you gripped. Its absolute gorgeous to look at Martin Ruhe’s cinematography is impeccable here and Director Anton Corbijn continues his sterling work after Control, and I can’t wait for his upcoming film A Most Wanted Man. Clooney is controlled classy and understated. I’m a massive fan of this film. Right up there for me in Wes Andersons locker. The set design is incredible. The book is one of my favourites and to see it transformed and enhanced is a delight, I wonder what Mr Dahl would of thought? Its Clooney’s silky drawl that carries this film along with some excellent support from Streep and Andersons usual pool of actors. (Murray Schwartzmann,Wilson,Dafoe) The score is wonderful from Desplat and it ties the room together perfectly. Ocean’s Eleven, the 2001 Crime Thriller remake is fun, stylish and top class Blockbuster fayre. Super cool Danny Ocean leads his crew (including Pitt, Damon, Gould,C Affleck and Bernie Mac). Soderbergh wields his magic here to make it superior to Lewis Milestone’s 1960 original. This Heist movie sees Danny and his crew to try to pull off a 150 Million Dollar robbery from Casinos run by ruthless Terry Benedict ( slimy Andy Garcia) during a boxing match. Clooney is on excellent form here having a blast with his friend Pitt, Its paint by numbers stuff but done in an impeccable way. 4 HUMOUR O Brother Where Art Thou? This 2000 humdinger of adventure comedy by the Coen’s is one of my favourites in this Genre. Loosely based on Homer’s Odyssey epic poem, Clooney plays Everett McGill, an escaped convict who leads a gang of 3 in search of a hidden treasure stash which will changed their miserable lives forever. This film is riddled with quotable lines and excellent performances. Clooney leads the way in an offbeat role, and once again he’s up to task with some brilliant ‘face acting’ and comic timing. The motley crew find themselves in difficult spots time and again and this leads us to some scenes that are right out of the top draw. The KKK, the baptism and the frog scenes spring to find as well as the Soggy bottom Boys. The Soundtrack is marvellous, Alison Krauss became a firm favourite of mine after seeing this. Syriana is a captivating film about, oil and money and politics set in Iran. Clooney plays aging CIA agent Bob Barnes in this corruption thriller. The plot isn’t a easy one, interwoven stories, no solutions, double crossing it’s all here, but I found it totally enthralling to be in this hyper realistic film. Clooney put on 30lbs for the role apparently with bowls and bowls of pasta and also supports a huge beard. This dedication obviously paid off with a Oscar win for best supporting Actor. If you’re after a intelligent head scratcher then I suggest you look here. So Yes I love George, the truth will out.